Three security guards have been found not guilty of the manslaughter of a man who died when they were repatriating him back to Angola. Along with his wife Adrienne Makenda Kambana, Jimmy Mubenga lived in Ilford, east London, after arriving in the UK in 1994. In 2006, he became involved in a dispute on an evening out that led him to being convicted of causing actual bodily harm and he served two years in prison. The 46-year-old was in the process of applying for permanent UK residency when the decision to deport him was taken. It was on a flight from Heathrow Airport in October 2010 that Mr Mubenga died and numerous investigations into the circumstances surrounding his death followed. Mr Mubenga, father of five, dies of a cardiac arrest after being restrained on the plane. An investigation is launched. Mr Mubenga's 16-year-old son Roland says he is "angry and upset", adding "it wasn't a natural death". MPs call for an inquiry into the Angolan man's death. Keith Vaz, chair of the Home Affairs Select Committee, urges for a full-ranging inquiry to be held while Tom Brake MP wants the incident debated in Parliament. A post-mortem examination on Mr Mubenga proves inconclusive. Three security guards are arrested and released on police bail. G4S said in a statement that three employees were "continuing to help the police with their investigation". The UK Border Agency says G4S is to stop escorting detainees and is being replaced with another firm. It adds the decision is unconnected to Mr Mubenga's death. Mr Mubenga's family call for an inquiry into his death. They march from the Angolan Embassy to the Home Office where they deliver a letter calling for an inquiry into the use of force during deportation. A year on from his death, Mr Mubenga's widow urges justice to be done quickly, saying that would "reduce the pain". At a vigil, she says: "I don't want the children to be involved in this case because they are too young. I want to finish it by myself before they are grown up." Media captionEmma Ginn: The complaints process for the Border Agency is "a joke"
Private security guards employed to forcibly remove people from the UK have used racist language and inappropriate force, a report by MPs says. The MPs did not comment on the case, but said Mr Mubenga's death had triggered their own investigations into the way the UK Border Agency managed the deportation of people on flights from the UK. No charges are brought against the three G4S officers because of a lack of evidence. Gaon Hart, Senior Crown Advocate for the Crown Prosecution Service, said a gross negligence manslaughter case could not be made against them because it needed to be "specifically proved that Mr Mubenga was held in a 'severely splinted position'... for a sufficient period of time to show that it was the actions of the security guards - and nothing else - which was the more than a minimal cause of Mr Mubenga's death". He said no witness had an unrestricted view of what happened. An inquest into Mr Mubenga's death opens. Isleworth Crown Court hears he had been restrained by the three guards - Terence Hughes, Stuart Tribelnig and Colin Kaler. Paramedics found no signs of life when they arrived the scene, the inquest hears. The G4S guards say he was breathing shortly before an ambulance arrived, but a paramedic tells the inquest Mr Mubenga had "no pulse" when he arrived. The inquest jury rules Mr Mubenga was unlawfully killed. The jury found he died of cardio-respiratory collapse, in which the heart stops beating and a person stops breathing. Returning the verdict, the jury foreman said: "Based on the evidence we have heard, we have found Mr Mubenga was pushed or held down by one or more of the guards. "We find that this was unreasonable force. The guards would have known that they would have caused harm to Mr Mubenga, if not serious harm." 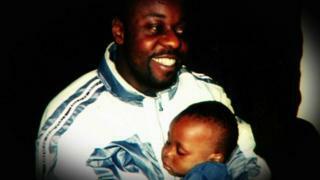 As a result, the CPS says it will reconsider its decision not to bring charges over Mr Mubenga's death. Media captionAdrienne Makenda Kambana: "I feel like Jimmy's resting in peace now, because everything, it was behind the door, now it's come out." The coroner criticises G4S, saying there is "pervasive racism" in the firm contracted to carry out the government's removals. Karon Monaghan QC says in her report the "numerous" racist text messages found on the mobile phones of two of the officers removing Mr Mubenga "were not evidence of a couple of 'rotten apples' but rather seemed to evidence a more pervasive racism within G4S". The CPS decides to charge the three guards with manslaughter. It says it has reviewed the evidence and believes there is a "realistic prospect of conviction". Following a six-week trial at the Old Bailey, the guards are found not guilty of Mr Mubenga's manslaughter.